Pandanus Resort is a luxury resort offering the necessary infrastructure and level of service for pampering its guest and delivering the right level of relaxation and peace of mind. In order to showcase the unique atmosphere and environment of the resort, the management board wished to create a quality 360° virtual tour. To fulfill this requirement, GlobalVision Communication was selected to create a complete multi-supports virtual tour. In this project, we created a complete concept to valorize the environment and give quality pictures to be used in all of its public communication materials, be it print of electronic. 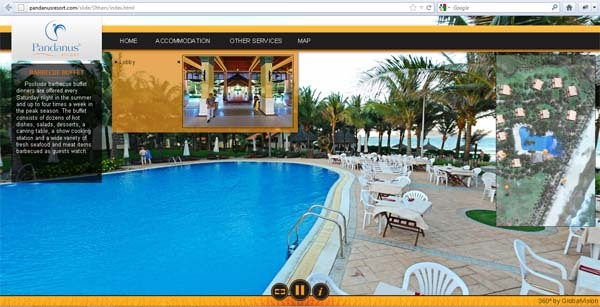 As such, the resort, now have a complete communication solution, but also a jewel of software technology, displaying correctly for Mac and PC computers, as well as Android mobile phones and Iphone/Ipad, with an adapted version in HTML5 et CSS3. This new international assignment, created by GlobalVision’s Asia-Pacific branch, shows our capability to offer visual solution wherever the location of our customers. If you also wish to create a 360° virtual tour of your facilities, contact the local GlobalVision representation nearest to you for a quotation.